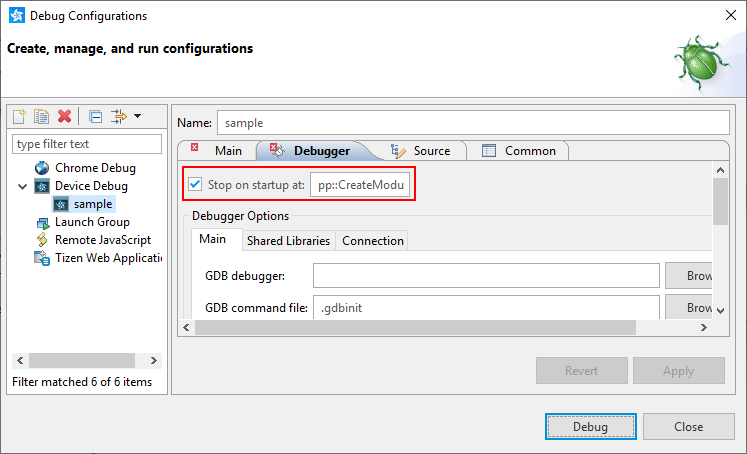 This topic describes how to debug Native Client projects with the Tizen Studio. You can use the Tizen Studio debugger to test Native Client (NaCl) applications. The NaCl debugger is based on the Eclipse remote debugger. For more information on the remote debugger, see Remote Debugging. On the emulator, you must launch an appropriate emulator instance. Obtain a Samsung-provided Smart TV developer model. For more information, contact a Samsung representative by going to "Samsung Apps TV Seller Office > Support > 1:1 Q&A". You can also test your application on a retail Samsung Smart TV, but NaCl debugging support is not guaranteed. Connect the TV to the Tizen Studio. Create breakpoints in the source code by double-clicking in the source code editor left margin. 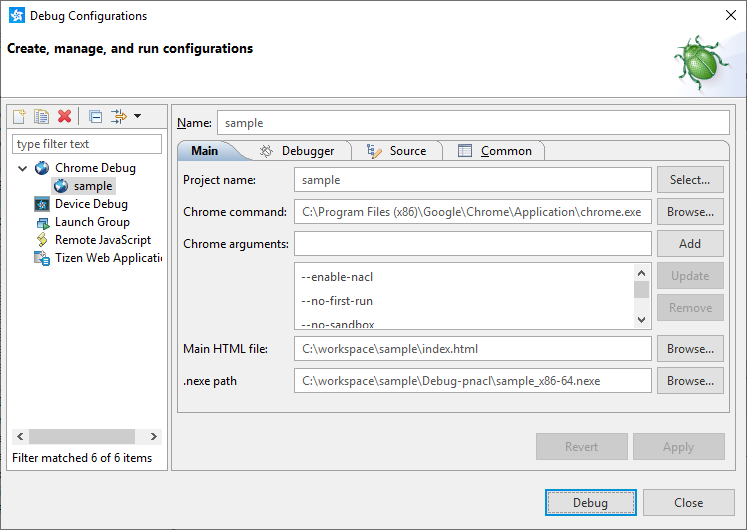 To debug the application in Google Chrome™, in the "Project Explorer" view, right-click the project and select "Debug As > Webpage in Chrome". In the Tizen Studio toolbar, select the emulator instance or TV from the drop-down menu. In the "Project Explorer" view, right-click the project and select "Debug As > Widget on a Tizen Device". You can also customize the debug configuration. The process is similar to customizing the launch configuration. 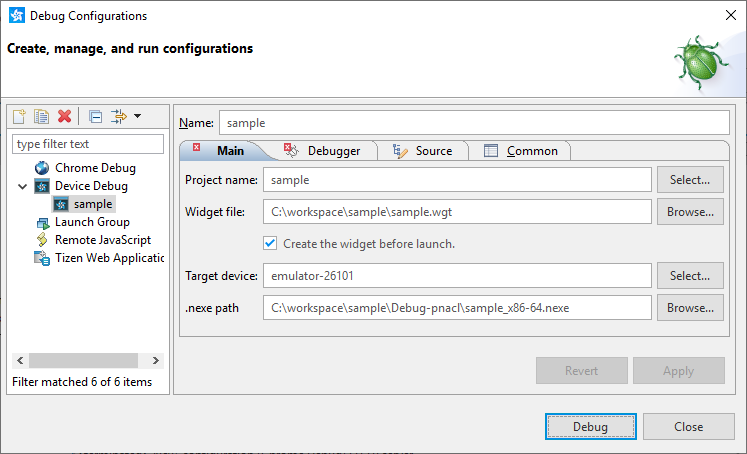 In the Tizen Studio menu, select "Debug As > Debug Configurations". In the side menu, double-click "Chrome Debug". Enter the configuration name, project name, and main HTML file path, and customize the launch parameters. In the "Chrome command" field, define the path to your Google Chrome™ executable file location. Select the emulator or TV you want to debug the application on. Define the path to the compiled NaCl module (".nexe" file) in your project. If you want to set a debugging entry point, in the "Debugger" tab, fill the "Stop on startup" checkbox and define the entry function. Do not modify the settings in the "Debugger" sub-tabs or the "Source" and "Common" tabs. To start debugging, click "Debug".